Fresh Methi Sambar is a delicious and healthy rice accompaniment prepared with shallots and of course methi leaves. 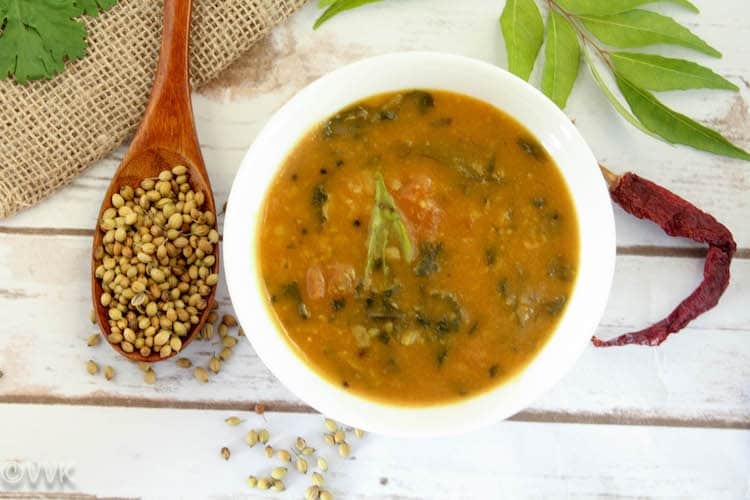 Keerai kuzhambu or spinach sambar is one among the traditional recipes of Tamil Nadu. Instead of regular amaranth greens, I went with methi leaves. 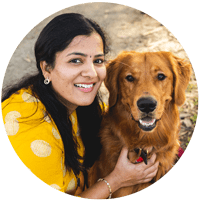 With a lot of things going around, I am participating only in two-week blogging marathon. 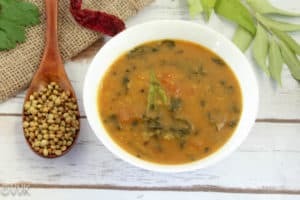 This week theme is, one ingredient – three recipes and I picked Methi as my ingredient, so my theme is now “Recipes with Methi.” Methi leaves or Vendiya Keerai as we say in Tamil or Fenugreek leaves, falls under the spinach family, and Indian is the most significant producer of this greens. I use this fenugreek in all formats. 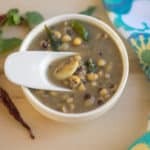 I use methi/fenugreek seeds for tadka, kasoori methi (dried methi leaves) for dal and some gravies and fresh methi leaves for sambar, dal, paratha, etc. I don’t want to repeat the medicinal values. I recently came across this article about methi leaves and its benefits. To merely say, Fenugreek leaves is a fantastic herb with a lot of medicinal values. 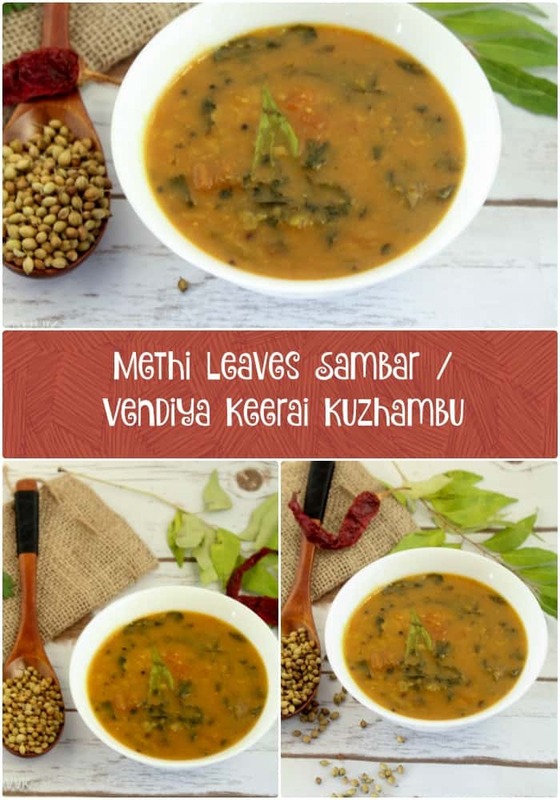 Kicking off this week theme with Methi leaves sambar or Vendiya keerai kuzhambu. 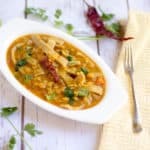 Pressure cook the toor dal by adding turmeric powder and 2 cups of water. While the dal is getting done, we can do the other prep work. Remove the methi leaves from the stems and clean them. (Discard the stems) And Chop them roughly. Peel the shallots and chop them into two pieces and cut the tomatoes too. Now heat the kadai or pan and add oil. As the mustard seeds start to splutter, add the shallots and cook till they are translucent. Now add the tomatoes and methi together. Add salt and turmeric and let it cook till the tomatoes become mushy. Now mix the rice flour with the cooked toor dal and mash it well. Add this to the sambar. Rice flour acts as thickening agent. Add the curry leaves and let it cook for another 5 minutes. That’s it. Yummy methi kuzhambu is ready. Adjust the tamarind according to the tanginess of tomatoes. Tomatoes are entirely optional. You can skip them as well. Instead of shallots, you can use regular onions. Fresh Methi Sambar is a delicious and healthy rice accompaniment prepared with shallots and of course methi leaves. As they start to splutter add the shallots and cook till they are translucent. That's it. Yummy methi kuzhambu is ready. Instead of shallots you can use regular onions. 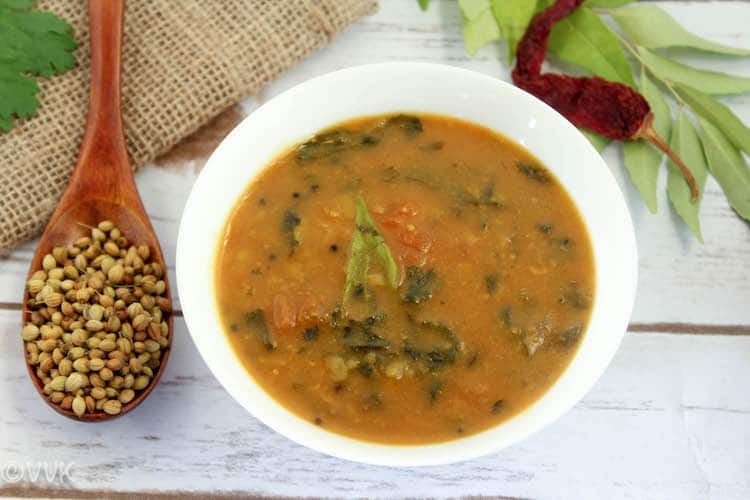 Such a comforting and hearty methi sambar. Lipsmacking kuzhambu, serve me with rice and papads, can have my lunch happily. Love kuzhambu of any kind…this one looks awesome! Methi is one of my favourites. We also make this with some variation. We love fresh methi during the winter months. Lots is uses and so healthy. That’s such a comfort food..love this! I love Methi. 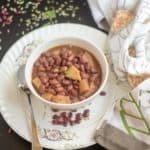 I don’t know if you have tried making the sweet dal with Methi, Srividhya. If not, do try it. No Aruna, I haven’t tried. Thanks a lot for the idea. Will give it a try soon. Do you have it in your blog? Errrr… vidya I am not sure about East Coast farmers market. Here in CA we get lot of local produce so methi, okra are very common here. If you get it thats awesome. 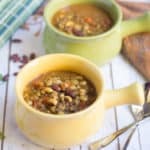 Love this sambar.Ultimate comfort food!!! I had Methi Sambar for my lunch dear!! 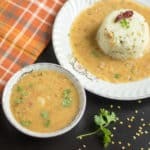 yummy and delicious sambar..